Stefan Sagmeister is a designer who blends typography and imagery in striking, fresh, ambitious, and unsettling ways. Having influenced the culture of design over the past decade, he is perhaps best known for his album covers for Talking Heads, Lou Reed, OK Go, and The Rolling Stones, to name only a few, as well as innovative campaigns, for companies like Levis, that have entered the public consciousness. Stefan Sagmeister was born in the small town of Bregenz, Austria in 1962. He claims he became a designer after failing at being a musician and a journalist. Realizing he was more interested in the layouts of newspapers and CDs, he went on to study graphic design at the University of Applied Arts in Vienna. In 1987, he won a Fulbright scholarship to attend the Pratt Institute in New York, after which, he attained a job with the Leo Burnett Design Group in Hong Kong, where he worked until returning to New York in 1993 to work for the Hungarian graphic designer Tibor Kalman. 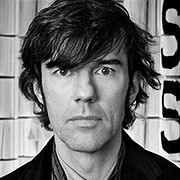 Soon after, Sagmeister opened his own graphic design studio Sagmeister Inc. and was nominated for a Grammy award for the album cover of H.P. Zinker's Mountains of Madness. Throughout the 1990s, he designed album packages for David Byrne, Lou Reed, and the Rolling Stones. After a sabbatical year in 2001, he released the design monograph Made You Look and in 2005, won a Grammy award for art direction of the Once in a Lifetime Talking Heads boxed set.